Go forward in time to May 2006. It is so damn boring. I can't stand them any longer. I just can't find a lecture about the OSI model interesting. It bores me like hell. And, as I am not obligated to attend the lectures, nor writing the exams, I think I will quit them in any moment. On the other hand, Syntax-Directed Semantics and Logic are getting funnier and funnier. I enjoy like hell the lectures and learning about them. I strongly prefer to attend such lectures with a lot of useless theory than those very useful ones. I said once that coming to Germany would be the opportunity to discover if I really care about Computer Science more than about Computer Engineering. Now I think there are no doubts about it. Interesting article in Icarito: Uso de mayúsculas en la Lengua Española. Recommended for those who forgot how to use them. For some strange reason my GNOME 2.16 build was linking a lot of the modules against my GNOME 2.14 build. A real pain because this meant that a) the libraries of 2.16 get untested, b) some new API used by some programs (like GBookmarkFile on GLib) wasn't available, producing linking errors, c) given that I didn't know the reason, I had to compile everything again, making sure that the linking was done properly. -L/opt/gnome-2.16/lib is right, -L/opt/gnome2head/lib is not. If some of the libraries, say libfoo has a libfoo.la file with a dependency on another library residing on /opt/gnome2head/, that carries a dependency on that library on every single library depending on libfoo, so I needed to take care of this following the dependency order on the stack. Sigh. I have to say that this is the first time that building GNOME is such a pain, not only because of this but also a lot of bugs arised (the intltool transition, some libraries presence wrongly checked, etc). Somebody needs to start bugging developers so they worry a little more that everything compiles out of CVS without problems. Yes, I will. On Sunday, finally I felt better and in shape to wake up from bed and start doing some work again. I skipped a lot of lectures so I have been trying to catch up with learning. Some german too, as my level got to a state where it is enough for do most of the daily talking without needing more complex structures, but there are a lot of things that I will need to learn if I want to have something better than an intermediate level german. Now, I am learning a lot of useful verbs with their prepositions. Just like in English, verbs are accompanied most of the times by a preposition which indicates exactly the action what the verb is referring to. You have to know them all by heart if you want to say coherent sentences, and that needs a lot of practice. Sometimes I wonder how would my life be if I haven't had invested so much time in learning German. Would I be a better programmer? or a better student? I think maybe yes, and probably I would even be a better son and friend, as I have seen myself locked learning this damn language for years, apart from the people I love and just learning, learning, learning. Now that I have about three months left in Germany, I start to wonder if it did worth the time. Nothing tells me for sure that I will need German again in the future if I don't make it and come back somehow, but that is only one more reason to study harder so I can write an excellent exam DSH. Nóra will come to Dresden next week. It is a great new and I can't wait for her to arrive. Everyday without her becomes harder and harder. I have made more work in the EogThumbView during the last days. Lucas is on the opinion of having such an eye candy in the thumbnails, but I think it doesn't really fit with the GNOME style. I would prefer something like this or even this. What do you think? Please mail me and give me your comments with your GNOME hat on, I will certainly appreciate it. Since the day before yesterday, I have been sick, in bed with a fever and a horrible headache that didn't let me go to my lectures. It has been very boring days, as I haven't been in the mood to do any productive work. A lot of TV, some web browsing, and also watched Hostel, a very sick movie that gives you the very wrong impression about east European countries. I hope to be better tomorrow, but I will have to skip swimming anyway. Sigh. I got the offer from my German teacher to write the exam Deutsche Sprachprüfung für den Hochschulzugang (German language Exam for the access to Superior Studies) on middle of July, instead of Test DaF (that I should write during the days of GUADEC). This exam has the same validity when it is about studying in Germany, and I can write it for free in the TU. The only disadvantage of this exam, is that it is structured differently to DaF, so I will need to prepare specially for it, alone. But the good new is that there will be a preparatory course for DSH during the semester, that will begin next week. My German teacher very kindly got me a place in this course, so I will meet there more people willing to write DSH and I won't be preparing it alone. So, it seems there is GUADEC for me this year. I am completely happy about it, and looking forward to present a introductory GTK+ tutorial for GUADEC-ES. We'll see. 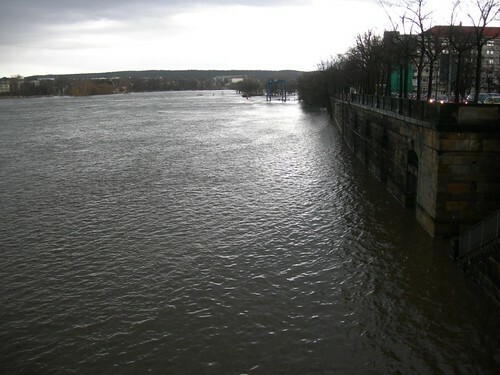 Good to read on the news that the level of the Elbe is slowly decreasing (article in German). Thank you, dear administrator. It is incredible how much the amount of crap emails has decreased during the last days. Thanks a lot! During the last weeks I've been working in a major re-factoring of the EOG collection pane. Basically, it consisted on rewriting the existing GNOME Canvas based widget to a GtkIconView derived class, and the completely-from-scratch EogImageList to a GtkListStore derived class. There are still some issues that need to be worked, but in a insomnia attack, this morning I commited the code to the eog-ng branch. Please, give it a test (cvs -z3 co -r eog-ng eog) and put your comments on the bug 336973. Yesterday began the semester. I visited the first lecture, Syntax-Based Semantics, and it looks very interesting. Hopefully, it won't become impossible to understand with the days. The Elbe keeps on rising. Yesterday we had occasional but intense rain and the temperature is still over the 10° C in the average. A lot of snow and ice melting everywhere, and the rain during the last days is starting to cause problems in the east of Germany and in the Czech Republic. Marie told me that last night her grandma had to leave her house because of the risk. A lot of people in the little towns by the riverside have been evacuated, and probably today some people in Dresden will be evacuated too. If the river floods heavily, there is a very little probability that it will get till my place. I live like 500 mts. from the riverside, but you never know. Hopefully nobody will get hurt. And even when the situation is still not catastrophic, this is not an April's fools joke. More pics in the Hochwasser flickr group. Go backwards in time to March 2006.